There are so many positives to a networked casino floor. The most commonly embraced is probably on the cash-handling side, where a network allows peripherals to talk to the back office with real-time accounting statistics. It allows an operator to see who has accessed what and when, if a cash box needs emptying, if there’s a jam… In short, it allows the casino to have greater uptime and enhanced diagnostic tools for machine hardware. That’s just with a basic Ethernet setup. Introduce a server-based gaming system into the mix and you can have so much more information. So where has it gone wrong? Well, it hasn’t exactly gone wrong – but from being a must-have, server-based gaming has become a will-have, when the time is right. There is no urgency to install the infrastructure because many operators cannot see the magic bullet that will enhance their business. In reality, it’s many different positives brought by a server-based setup that make it so appealing, and that genuinely drive ROI. Walt Eisele, VP of Technology, Bally Technologies, explained to Casino International: “Six or seven years ago, the initial pitch for server-based gaming was that, we will have this remote management capability where I can put a bunch of game content on a server, and download whatever games I want to that terminal. That was the initial thought, and it sounds ok. But at the end of the day players are not going to sit and shop for games by going through a menu. They will be attracted to an EGM if it has a theme or a particular style of game that player likes, and they are going to play it for that reason. Multigame works in some markets where you might have a small number of machines and you want to offer a wider variety of content, but generally speaking you have a number of multigames loaded on the cabinet for the player to navigate between. But it turned out to be a little impractical to deliver content from a server in real time because of the size of the games and some other factors. But what has delayed widespread implementation of SBG on gaming floors now the product is mature? Partly, it’s the cost of installing that vital infrastructure, even though that very cost will be returned directly through efficiencies, and partly it’s the lack of that one killer function that makes it obviously indispensible. Walt explained: “If you look at SBG in its most basic form, which would imply a high-speed network connection to the gaming device, some type of back-of-house structure that allows you to manage that device, there is some complexity there and a bit of expense. It’s been very challenging to prove to operators that there is adequate return on investment for outing in a high-speed network across their gaming floor and investing in a server structure. There is also more complexity there too, because operating with these systems allows you to do things but it also has the potential for more things to get messed up. All those factors pile together, and it sounds really good and there is real upside to it, but we have yet to find as an industry that indispensible feature it has. It makes you wonder why business is not already done that way – but of course it is, in markets where legislation can ensure adoption of high technical standards. For example, markets switching to a VLT model. Walt said: “In Canada some provinces recently went through a VLT procurement cycle and a requirement if you cared to bid on that opportunity was twofold: you had to have a fully implemented G2S [Game to System] standard communication protocol, and you also had to implement a GDS [Gaming Device Standard, the protocol that allows peripherals to communicate to the game itself using open standards]. Both protocols are enablers for server-based gaming, essentially, for download configuration etc. So you are starting to see it take hold. Is it that simple? One of the obstacles facing a server-based gaming cabinet is how to alert players to new content, or even to the fact that the cabinet contains a large amount of content. Lee Gregory, Managing Director of Inspired, a server-based gaming specialist, says players have not been engaged correctly yet. “I don’t believe players have been engaged with the full benefit of server-based gaming and choice of games; I do believe that the casino supply industry always made game choice secondary. By that I mean that if you play SBG products, successful products in Europe, you are generally presented with the menu of choice first and from that the player makes their selection. In a card-based system, that could be the player’s selected favourites. Generally though, the casino adoption had a default game, so it launched you in to game ‘A’ and there were buttons or icons hidden away offering more games or functionality, hidden away in the top left corner. Players could go and choose that button and select alternative content, but the core proposition presented to the player did not encourage the selection of multigame. I don’t think the analogue venue really ever adopted multigame in the way we would recommend, and presented it to the consumer in the right way. I think partly the reason it may have waned in global terms is because of how SBG gaming has been presented to players. So how do you get around that issue with casinos today? Lee elaborated: “If you had a casino with 3000 slots, you don’t have to change them to SBG overnight – but you have to dedicate an area and commit to staff development and training so the area supports and displays the benefits of server-based gaming, and the staff are aware and educated on those benefits so they can communicate it to the consumer. Then there is the user interface, the way the games are presented to the player. The way our interface works, we took leads from best-in-class products from entertainment, from the web, to present to the player in a way they are comfortable and familiar with. From there you have to choose the right games to present to the player and engage the player from that initial contact. Build the right menu, put it on the product, present it in the right way; then across a gaming area, mix those menus and configurations so you can deliver a more compelling gaming experience to the players. A growing percentage of players enjoy choice and variety, and we believe that can be delivered through one compelling terminal rather than having to move the player from one physical location to another. Server-based gaming could be part of a raft of technology combining to make the next shift in gaming technology, says Lee – when used with a card-based loyalty system to tailor to the player’s experiences and learn from their play data. Lee added: “One of this year’s G2E seminars featured experienced, credible casino operators talking, and they suggested the industry needs to find that ‘next step’ for change to drive to the player. The innovation in hardware – bigger, wider screens, more physical presence of a terminal, and licensed brands – has not driven growth in the sector. They were referencing innovations like TITO, card-based loyalty systems, as the transformational items, and they were imploring the industry to look for innovations and changes that will drive new consumer behaviour. Having been involved in the very early development of server-based gaming for the lottery in Washington up to today’s work with Bally Technologies, Walt is well-placed to comment on the future for server-based gaming, and that future remains bright. Walt concluded: “I think what we will see is probably a move towards something that was not even envisioned early on in the development of server-based; it will be used for other, more entertaining things. For example, on Bally systems we are able to distribute player experiences across gaming floors. It uses SBG to provide features of a virtual horse race that can be displayed at the game; eligible players can take part, the server controls the experience. We have seen some very positive outcomes from that, meaning there has been revenue increase from using those kinds of server-based elements. Creativity will allow server-based to continue to evolve; another piece of it that will probably come into play at some point is a more efficient means of delivering content to gaming devices. If you look at a typical game today they look very nice, typically high-definition graphics and sound, very visually appealing but that also comes with the expense of being very very large in terms of data size. Moving that kind of data around a network – even a local area network – there are some practical limitations there. The company e-gaming has been operating in the field of SBG since 2005 and today is active in more than 10 countries worldwide in which it offers its products to its customers. e-gaming operates, either directly or with partners in these countries, currently more than 20,000 terminals and the numbers are constantly increasing, especially due to the fact that it is looking for new territories and jurisdictions in which it is possible to begin to operate legally Server Based Gaming setup. Recently, many countries are beginning discussions associated with the requirement for increased control and better monitoring of land-based gaming operations from the state; these territories are what we are actively seeking and have a keen eye on for the long-term. Recently, for example, Macedonia and Spain, where we not only successfully passed the certification process as one of the first ever, but even started operations and already today we can say that successfully, the results that we achieve here are more than satisfactory. Other countries we have also in the viewfinder because the legislative changes are there only at the very beginning or in the process or because there is simply not the “right” time in the market. Apart from the above-mentioned countries we always rank among our priorities the domestic markets which means the Czech and Slovak market, where we achieve excellent results despite of the strong competition and a difficult period in terms of pending legislative changes. e-gaming is a young, but very flexible company in the field of SBG. We regard SBG as more than download and configuration, it’s also the ability of the casino management system to deliver unique content to a game. Konami Gaming’s casino management system SYNKROS provides server-based gaming products and bonusing applications like our True-Time Tournaments and is able to deliver server-based content to any video-based EGM on the floor, in our case, by means of True-Time Windowing (picture in a picture). This method of delivering a unique game to any EGM is in essence SBG. Although it doesn’t physically download onto the EGM, it’s still a valid methodology because content is coming from the server into the video screen. And to the player, he or she is experiencing and interacting with a different game initiated by the player…on demand. Fundamentally, that is server-based gaming. With regards to conventional “download and configuration” of actual slot games that reside within the EGM’s CPU, another benefit SYNKROS brings by way of automation in relation to SBG is its PAR Uploader functionality. Regardless if a game is updated by a server or manually by a technician, SYNKROS automatically queries the machine for any changes—such as the configuration of game indexes and associated information like hold percentages, pay table codes and active themes—thereby replacing manual entry processes with real-time data feeds. Any conversions, versioning updates or pricing changes are automatically detected hands-free, across all game types and manufacturers. Conceptually, one of the major advantages of SBG is that games can be converted and priced in short period of time. Labor is reduced. Inventory needs are reduced. So conceptually, those ideas make SBG advantageous for doing business, but reality tells a different story. Operators love the concept of dynamically configuring game content throughout their property, but floor-wide implementation is simply nonexistent. What we see are localized installations of SBG, offered by certain manufacturers, and typically only to those manufacturers’ games – and SBG’s capacity for revenue management and cost savings really only works if you have the entire floor connected. You can’t just fluctuate the pricing or game selection on a certain set of 30 or 40 machines and expect them to provide any sort of meaningful advantage. SBG hasn’t become as popular as the industry expected it to. And it’s important to remember that the delivery mechanism isn’t nearly as important as the content that’s being delivered. While some operators may elect to make frequent changes to their floors, others are more interested in performing content the works any day of the week. This makes changing the floor less critical. While there will be incremental functionality improvements, SBG isn’t likely to revolutionize the floor anytime soon. Until there is an industry-wide acceptance of this technology, and a clear understanding among manufacturers that it’s what the market requires, SBG will continue to be a niche product. Server-based gaming is a prerequisite to operate Video Lottery Terminals (VLT). Here AMATIC Industries has a wealth of experience. The MLT – Multi Lottery Terminal – is the VLT solution from AMATIC. It perfectly combines security, transparency, simplicity and flexibility. All features and mathematics are performed by the server, leaving the gaming machines to simply portray the game from the server. The game server handles the complete process on-line in real time, including the machine payment management system. A customer-friendly platform caters for increased customer acceptance. Integrating SBG is a highly complex matter and thus only a handful of major gaming manufacturers are able to offer the right solution. AMATIC Industries belongs to such manufacturers. We believe that this complexity is a contributing factor to the relatively slow take-up. Nevertheless, once SBG gaming is integrated, then the advantages are clear for all to see. We believe that more and more European countries will be adopting SBG. We are placed in the heart of Europe, perfectly positioned to support our European partners. SBG allows operators better earning possibilities, players more choice and governments more control. Thus, all people who are involved in the chain benefit. Has server-based gaming found its magic bullet, the one thing that makes it invaluable for all operators? If so, what is that? SBG gaming is still in growth mode. There are some particular segments that require it as standard (VLT) or are making more use of it (Casinos). The largest gaming segment remains AWP in Europe and this is where we see great benefits for the future but naturally also strong potential demand for the AMATIC SBG gaming solutions. If not – how will the technology evolve and where is it going in the future? The only way is up for SBG gaming – all in land-based segments. SBG gaming is a precondition to link land-based and online / mobile gaming together – a great matter of heart for our company. How does your product fit into that landscape? Our MLT solution is targeted to attain optimal benefits for all gaming segments and for the online / mobile market as well. This is future-proof and future-driven technology. How does the operator benefit through all of this? The operator can offer gaming over various channels, which allows players to access games on other platforms as well, such as mobile phones or tablets – so SBG offers huge growth potential. In this way, players will be more satisfied and more loyal to the operator. An optional Jackpot-system increases attractiveness and completes the package. The operator has the further advantage of having a complete overview of all machines or games online and can more readily adapt the gaming offer to fit player requirements best. Additionally SBG gaming provides higher security to the operator, since the RNG and game logic can`t be manipulated at individual terminals due to centralized control. MLT from AMATIC Industries is an excellent and powerful VLT solution with full monitoring and maximum revenue. Following its tradition to be on the cutting edge of the technology wave, Casino Technology is offering a state-of-the-art convergence solution aimed to blend traditionally separated land-based and online sectors and provide a seamless gaming experience. SERVER GAMES TECHNOLOGY (SGT) convergence platform, tailored to provide flexible game content integration among all known land-based, server-based, mobile and online gaming platforms, was launched in 2012 as an immediate answer to the increased demand of faster, multi-channel and more flexible ways of betting. It is the main concept behind Casino Technology’s ELEPHANT Remote Game Server, offering access to a huge variety of genuine Casino Technology’s game content for video slots, bingo, roulette as well as exclusive 3rd party content like virtual sports, sports betting, live games to all existing gaming channels. ELEPHANT provides all the benefits and flexible applications needed to enter the next stage of gaming evolution, including instant access to any game available in an operator’s catalogue and additional gaming content. With diversity being the main driving force behind modern players preferences, ELEPHANT is the perfect tool to offer maximum game variety as the list of available games is constantly enhanced with new and proven Casino Technology’s titles adopted for online use. The rich library of more than 160 titles, many of them proven top-reformers on different markets around the globe, ensures that every player will find his favorite game or concept without any effort and in no time. ELEPHANT integration with leading international platform providers is further expanding its reach, making some of Company’s most successful titles available for millions of new players all over the world. Its full compatibility with the rest of Casino Technology’s systems under the collective brand of THE BIG 5 creates a unique and complete gaming online/offline environment, empowering the future of gaming. Inspired has pioneered and led the Server Based Gaming (SBG) market. Its SBG proposition is the most innovative and extensive on the market – it covers the entire spectrum of fully networked and digital products, from SBG VLT, SBG Slots, SBG Casino Electronic Table Games to Virtual Sports and Remote Game Server technology for mobile gaming solutions. Inspired has invested years of research and development into its Open SBG Core™ platform and manage over 35,000 live endpoints. Separating the content and games from the physical terminal lowers costs and increases incomes. The Open SBG Core™ technology also operates an Open API for third party game developers to develop content for, thus increasing the flexibility of the product and driving up operators’ incomes. Inspired has market leading SBG positions in the UK and Italy, the world’s two most technically advanced Distributed Gaming markets. It is officially the leading supplier of VLTs to UK bookmakers with 51% market share – its Storm cabinet is the UK’s highest income gaming machine and boasts a library of popular and engaging games. Every year Inspired puts an enormous amount of resource into SBG. The launch of its Eclipse cabinet in August 2013 and all its features was a result of significant investment and an exciting milestone in Inspired’s on-going SBG innovation strategy. It is already showing strong year-on-year growth. Other key benefits of Inspired’s SBG technology is that it is revolutionizing traditional bingo venues with multi-game products, Inspired is a member of the GSA (Gaming Standards Association) and supports S2S and G2S protocols – private or public operators will enjoy the versatility and consumer appeal of both, it’s system and terminal solutions..
Has server-based gaming found the one thing that makes it invaluable for all operators? And how does the operator benefit through all of this? With networked machines and end-points, operators have complete control and visibility over their gaming equipment and performance – which means that they can monitor and adjust settings and menus to maximize revenues. We can dynamically change game menus and marketing, stream marketing content to our terminals and also can apply our best in class responsible gaming solution, reacting to player and regulator requests in real time. SBG also means that two thirds of all machine faults are fixed remotely and in an average of 30 minutes, whether in the UK or internationally – which reduces downtime and maximizes performance. Due to Inspired’s SBG approach and experience, it is the supplier of choice for operators that understand the benefits of SBG. Just this year, Inspired signed a five year contract extension with William Hill, including an additional 4,000 Eclipse terminals. This means Inspired is contracted to supply William Hill with 100% of their VLT estate until 2020 – the longest contract ever achieved for a machines customer and a testament to their faith in Inspired and SBG. William Hill is now the market leading UK bookmaker. APEX gaming, true to the company motto of taking gaming to ‘The Next Level’, makes optimal use of SBG technology in its APEX Mobile Slots offer which was introduced to the global gaming market at this year’s ICE. This brings together land-based and tablet gaming. Operators can offer players to continue their gaming entertainment away from the gaming machine, yet within the casino location, such as in the bar or restaurant. Players continue playing on the same machine, so-to-speak, as the games are on the server. Benefit from the advantages of pure server-based gaming: real-time results, absolute control and resistance against any possible manipulation. The RFID technology allows players to simply enter credit on the tablet or ask the gaming staff to pay out winnings as well. Already the top fifteen APEX games are available here with many more to come soon. The brand new adaption of the iDROP acts as a redemption terminal, allowing players to transfer their credit to be paid out in the form of a barcode ticket – ready to play on the land-based slots in the casino. Similarly, players can add credit to their tablet by using this iDROP redemption terminal. This gives operators more flexibility to allow their customers to enjoy APEX games where they want to within the casino, not necessarily on the APEX slot machine. It is going in that direction. Innovation is taking it there and we are proud to be bringing server-based gaming to the next level with our APEX MOBILE SLOTS. Now SBG is being used to its full potential, linking together land-based and mobile gaming. How will the technology evolve and where is it going in the future? The technology will surely focus more and more on the benefits of the APEX MOBILE SLOTS. Players need to be given the greatest choice – and choice of where and when to play. ‘Play as you go’ or ‘play when you want to, where you want to’. APEX gaming is making this reality. This is how our solutions fit into the SBG landscape. 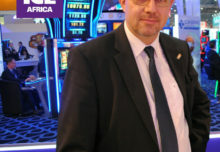 The Gauselmann Group develops and operates high-class Video Lottery Technology and Server-Based Gaming systems in several European countries. The company has decades of experience in manufacturing and operating gaming machines. This has made the Gauselmann Group a trusted partner in the industry and the unique knowledge base puts us at a strategic advantage. For the casino and VLT segments management systems play an essential role. The demands on gaming machine, arcade and casino operators are becoming increasingly more complex: Changing legal regulations, growing competition within the industry as well as alongside other recreational offers, an increasing number of companies and the correspondingly higher numbers of staff and customers. Only those who have a sound grasp of all the processes and can quickly react – such as when faults occur or new games become available – will be successful in the long term. The name of the game for networked games solutions revolves around security. Thus, all Gauselmann systems are developed involving ultra-modern technologies for optimal quality standards. Furthermore, the self-owned Gauselmann data processing centre in Espelkamp provides a powerful hub that is extremely secure and certified according to DIN EN ISO 27001. The Gauselmann Group offers the perfect tool for operators to get the most out of their business. Only those operators who have a complete overview of how their machines are performing can react and plan accordingly. This strategic information is the precondition to be able to optimise processes and products with the dual benefits of improving and streamlining operations and well as creating increased customer/player satisfaction. In recent years, Novomatic’s A-Serve platform has evolved into a vast technological entity with far-reaching capability and incredibly deep levels of functionality. It has become something of a tour de force in distributed gaming. NOVOMATIC and its subsidiary Astra Games decided to take a different approach with the development of A-Serve – server-supported gaming. In principle this means that the full control over the game remains local with the individual gaming machine and is not performed by a central server. The RNG (Random Number Generator), too, remains local with the gaming machine and ensures uninterrupted gaming fun, even if the system is offline. However, with A-Serve the content and numerous software and hardware parameters are centrally administered by remote content management via the server. The system is the result of a joint development project undertaken by the ATSI team in Poland, Astra Games in the UK and the Austrian headquarters’ R&D teams led by NOVOMATIC CTO Thomas Graf. It is essentially a highly efficient means of delivering proven, world class gaming content to UK bingo, pub and adult gaming centre (AGC) locations that offer categories B3 and Cat C. In the near future category B1 and B2 products will also be available. There are two elements; firstly, the Entertainment Studio which comprises diagnostics as well as game download and promotion functions and, secondly, Orbital which involves reporting. All this is achieved using, currently, the iconic FV762 and FV600 cabinets, in a way that is seamless, flexible and – crucially – reliable. And it is in the area of reliability where A-Serve has made such a tangible impact. As any good operator will testify, machine ‘downtime’ is an anathema to a profitable operation. A-Serve does more than any other platform to minimise that downtime by identifying issues such as paper jams or bill acceptor problems earlier, responding to them more rapidly and ultimately ensuring that players can keep on playing. Allied to that is A-Serve’s inherent flexibility, allowing new games to be added almost instantly with minimum disruption for the operator. The full extent of A-Serve’s functionality is quite staggering. Because terminals are always online, updates including full game packs can be carried out remotely without the need for a site visit. Those remote capabilities extend to enabling and disabling games, installing or deleting titles and altering themes or implementing legislation changes as and when they happen. A modular software design allows for the flexible configuration of a variety of game parameters such as denomination, stakes and payout percentages. A-Serve can also provide essential information regarding ‘machine state’ – in other words it can relay to the technical team information relating to machine faults, situations where there has been a player dispute/manipulation and player trend analysis. The team can then assess potential reasons for poor performance. Zane Mersich, Managing Director of Astra Games and CEO of the Astra Gaming Group, commented: “As a package that offers remote functionality, real world diagnostic capability and a platform for proven, best of breed game titles, A-Serve is peerless. It’s an asset that we are justifiably proud of. Playtech Retail is the umbrella group for all our retail products and technologies. It offers bespoke software and hardware solutions that deliver the ultimate multi-channel player experience, all within one seamless ecosystem. Using a single wallet an operator’s customers can play in-venue, at home, online or on the go – anytime, anywhere and on any device. We focus on a full retail solution for all operators, providing them with complete management options for land based venues, with the ability to connect all of their digital channels. This is the case for both existing and new online and mobile operators with retail outlets. As part of our package, we develop specialist, cutting-edge hardware in partnership with operators that can deliver any content through our Open Platform. These include slot cabinets, sports terminals, tablets, EPOS systems and many more. With us, operators have the ability to choose the content that suits their business requirements and deliver new, tailored devices, or provide added value to their existing offering. Our product range includes slot games, electronic table games, live casino content for venues and for broadcasting, pre-event, live & in-play sports betting, virtual sports, bingo, instant and traditional paper lottery games. With our analytics functionality, operators can capture and store detailed game data centrally. More importantly, our solution ensures they are actually able to utilise this data to grow their business. With custom-built control supported by specialist CRM capabilities, all land based operators have the advantage of being able to communicate with players how they wish. Even more significantly however, they can segment and tier their customers with our system, based on their profitability to the business, meaning that their most valuable customers can be treated differently to those less valuable. Has server-based gaming found the thing that makes it invaluable for all operators? Implementing a full multi-channel ecosystem, supported by a true single wallet, is now possible. Today, thanks to Playtech technology, operators can have full visibility of player lifecycles allowing them to understand 100% of player activity and, crucially, the real-time control of activity, communications, tracking and monitoring. The same content is available across all channels, allowing players to enjoy their favourite games in-venue, at home or on the move – anywhere, anytime, any content, and on any device. Our new real-time reporting, business intelligence (BI) and optimisation tools that we will be showcasing at ICE next February give operators a huge advantage in maximising revenues and driving revenue growth. Server-based gaming also allows operators to implement a universal responsible gaming policy, meaning that working in regulated markets makes gaming machines more accessible than ever before. Operators feel the benefits of lower hardware, software and maintenance costs, especially as all can be managed from one central system. Equally, more security benefits are now possible as game logic cannot be manipulated from the central server, ensuring protection for players and licensees. “Aristocrat On Demand,” or AOD, is Aristocrat’s answer to server-based gaming and promises download done right. AOD has a user-friendly interface that allows operators to easily and quickly download and configure new games. Through the power or AOD, Aristocrat’s customers receive the latest highly configurable games frequently, giving operators the opportunity to push new themes to their casino floors before anyone else, keeping players entertained with continuously new content, and keeping the casino ahead of the competition. Simplicity: If the product is too difficult to use, it’s practically worthless to the user. AOD features an intuitive user interface with a minimal learning curve. Efficiency: Server-based gaming should work easily and quickly, and with AOD, there are no more conversions and long wait time for new games. With AOD, operators can convert a game with just a few mouse clicks. Profitability: Because downloads are virtually instantaneous, AOD empowers operators to react quickly when they see a trend to yield more from their casino floor. The bottom line is Aristocrat On Demand is an invaluable new tool for all operators. With the power of AOD’s large game portfolio at their fingertips, slot directors become rock stars. Now they can trial new games and then confidently order new machines or conversions for all games that performed well on their floor. Additionally, the ability to change denomination (e.g. 1C to 2C) or changing the minimum bet multiplier with a simple mouse click on a busy weekend will significantly increase turnover. This scenario is more applicable to European casinos with limited floor space. First introduced at ICE 2012, IGT’s Cloud is a server-based casino solution that gives operators the configurability flexibility they need, a cost structure that makes sense and a player experience that exceeds expectations. It is a secure and versatile product that is transforming operations and player experiences around the world. Content is king and nobody does content better than IGT. Through IGT’s Cloud, operators are granted seamless, anytime, anywhere access to IGT’s game library containing more than 300 of the industry’s top-performing titles. Cloud’s on-demand content library allows operators an unprecedented speed to market across devices. IGT Cloud also enables operates to optimize casino operations through floor management tools and the ability to create and execute targeted marketing campaigns. As a component of sbX®, Analytics will empower casino operators to increase marketing productivity and maximize floor-wide performance with a variety of reporting tools. Sabby Gill, IGT SVP of International Sales: What’s great about server based gaming is that it’s the closest thing to being all things to all people and, as such, there really is no ‘one thing’ that makes it invaluable to operators – it’s actually a range of benefits that make it invaluable. Whether you’re looking for operational efficiency, greater flexibility, improved speed to market, maximizing player engagement or a host more benefits, server based gaming can deliver it. Depending on what you’re trying to do with your slot operations, server based gaming has the flexibility and functionality to help you get there. Server-based gaming continues to gain popularity around the world. In the EMEA region, where mobile and online betting is so well established, our server-based products, IGT Cloud and sbX, have a very strong presence. Accelerated access to new game packages, ability to draw more yield from each gaming machine and decreased operational cost of gaming machine management are immediate, tangible benefits to casino operations. There are further advantages from a customer service perspective, and when combined with features such as Service Window and advanced marketing applications, the capabilities are very compelling. In terms of the user experience, increased content velocity and a better customer experience are ultimately the goals of server-based and server-assisted gaming systems. We are already seeing the lines blurred between system and game content (digital glass being used for advertising, system bonuses represented on the game screens) and this is a trend that is picking up steam. The flexibility of real-time dynamic player messaging gives marketers a new avenue for customer engagement and opens the door for an altogether new player experience. I believe we will witness a shift from event driven casino entertainment to more of a lifecycle, or true brand experience. Loose ties between brick-and-mortar experiences and mobile/online experiences will become inseparable bonds. The key to that bond is a robust server-based and/or server-assisted platform. In today’s gaming climate, any product or service that has a proven track record for driving ROI is very compelling in the eyes of the operator. Our server based products are achieving that and the cost savings results that many of our customers share with us, are staggering.